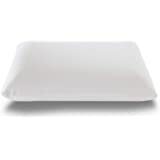 Shaped like a regular down pillow, but stuffed with hundreds of very small pieces of a plush foam fill and fiber blend, the Comfortac memory foam pillow is quite simply the most comfortable pillow you will ever own! 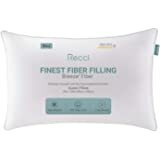 This Cloud-like pillow will cradle your body in only the way that high quality shredded foam can, for a down-like comfort that won't flatten out. 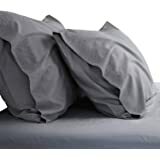 The Comfortac pillow does not need to be continually fluffed and will offer you extra support with its superior contouring abilities. 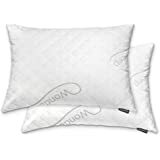 Although the pillow has a universal comfort that adapts to the shape of your body, only the Comfortac Deluxe pillow offers you adjustable firmness/support. 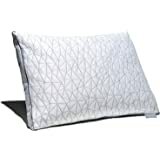 The Comfortac pillow has a 100% cotton case that is fully machine washable thanks to it breathable cover matrix, making it the most versatile, cool and coziest pillow available. 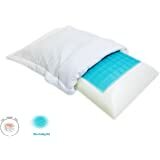 Order the Comfortac premium shredded memory foam pillow and enjoy the best night of sleep today! 1.0 out of 5 starsSeller paying for reviews! 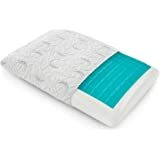 "We received your recent review of our Comfortac shredded memory foam pillows on amazon.com. We are extremely sorry about your unsatisfactory experience with our product and would hope you can give us a chance to make things right for you. We would like to offer you a $30 refund to your original order or an amazon.com gift-card to compensate you in the hope that you can re-evaluate your review of our product." So all of these 5 star reviews are presumably fake. Amazon ought to ban merchants that engage in this sort of unscrupulous business practice. This pillow is nothing special. It's adequately comfortable but despite running it through the dryer it has a tendency to collapse and become flat at night. Given the price, I was expecting something more luxurious and a pillow that won't become flat. I have collected plenty of pillows, trying to find the best one for me. After the short time I've own this pillow, I think I may have found it. a) remove the pillow case if you want to wash it. b) can remove the fill if you prefer less loft. 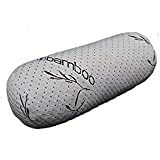 I am hoping that because it has a memory foam fill, that it will not break down over time and lose it's shape, like many other pillows I've owned. Perhaps the only knock I have is the foam smell of the pillow when new. But, after a couple days, the smell dissapates and is no longer noticeable. Very underwhelmed by this pillow. Following the directions and suggestions, I fluffed it in the dryer upon opening. Made it about an hour the first night before I tossed it off the bed - entirely too firm and big. The next day, I again followed suggestions and removed some of the stuffing. I've removed more, added it back in, and tried various ways. There is no happy medium. The pillow is either too stiff and large or it's flat and almost hard. I'm wishing I hadn't spent the money on this one - it's going in the garbage. 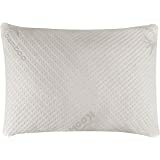 I'm not a big fan of memory foam, but it was time for a new pillow and I bought this pillow on sale. I followed the instructions and put the pillow into the dryer. It came out fully fluffed and stiff as a rock. First night was very uncomfortable and made my neck hurt. The next day I removed probably about 1/4 of the stuffing from the pillow, which was messy but do-able. 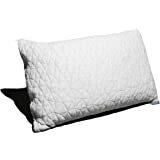 Now it is my favorite pillow and sleep comfortably with it every night. 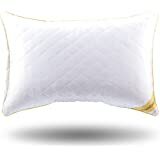 Would recommend this pillow to anyone willing to put in the effort to get it just right. I love this pillow. It is really comfortable and I like how it is easy to refresh the shape. 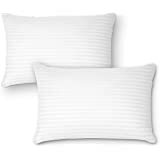 To many pillows lose their shape and then hurt your neck. I would recommend this pillow to anyone and am very happy that I found it. The customer service is excellent as well. Thanks for the great pillow. This is the first time I've ever spent so much on a pillow (and two of them, at that) and I really wish I hadn't. The idea of the shredded memory foam sounded great, but the small pieces shift throughout the night and I find myself constantly having to reshape it to get the support I need. I probably find my head has created a crater ever 15-20min or so. Furthermore, it says it helps to stay cool; not so at all. I in addition to reshaping it repeatedly through the night, I also have to reposition my head every 5-10min because my face is getting so hot on it. Needless to say, I haven't gotten a solid night's sleep since I bought these. Have been meaning to request a return for the last several days since my husband and I agreed we didn't like them and only just remembered since I've had the flu and been totally absent-minded. Unfortunately, the order says the window to return closed on 3/20/17 and it's 1:23AM on 3/21/17. Even. More. Disappointed. I would neither reorder nor recommend these pillows. The foam provides really good neck support, but it eventually flattens out overnight. I did remove a small amount of the foam to flatten it out a bit so that might be partly to blame. I just flip the pillow nightly to readjust. 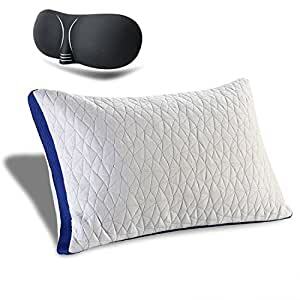 I like the fact that I can remove the outer cover to wash it without opening the inner pillow, which would cause the foam to go everywhere. This pillow really did change my sleep experience for the better. It's dense, perfectly conforming to the head but I will say that it conforms a bit much in that after a full night of sleep, your head can almost sink down to the mattress. I left all the material in and fluffed in the drier as recommended. Overall, love the pillow and would buy again.